South Eastern Railway circular uniform clothing (old and new) with details of issue and return. No.26. Issued by Myles Fenton, 14th April 1893. Printed by Mccorquodale. London & South Western Railway circular: opening of the Meon Valley Line between Alton and Fareham for passenger, parcels and goods traffic on Monday, June 1st, 1903. Circular No. 368, dated May 25th, 1903, and signed Henry Holmes, Superintendent of the line. Instructions, Midland & Great Northern Joint Railway, "To Be Observed By the Signalman on Duty at Salisbury Road", iIssued by William Marriott. G.O. 384, June 1924. Circular; re. Parcels traffic forwarded to & received from Stations on other Companies' lines, issued by Superintendents & Accountants, Waterloo Station, London & South Western Railway Company. Circular re. trial trip of Inspection Car from York to Malton, issued by John Welburn, Superintendent, District Superintendent's Office, York, North Eastern Railway, 1886. Circular No. 496 from the Office of Superintendent of the Line, London Bridge re instructions for working in event of a Railway Strike and insufficient men being available to carry out ordinary working, issued by Finlay Scott, Superintendent of the Line, London Brighton & South Coast Railway, c1910. Circular, L.N.E.R. Boards on Sites Away from Stations, From the advertising manager (Southern Area) London & North Eastern Railway, Describing the response that staff should make following damage either by enemy action or other means to replace or repair the advertising boards within three weeks, July 1941, (Other Associaitons 80/40/10). Circular to staff from British Rail Chairman entitled "A Personal Message from the Chairman", June 1965, by Maynard, regarding the future of British Rail, one sheet type written. Circular "Action to be taken by Southern Railway Home Guard in the event of invasion", issued by F J Wymer, Colonel, Commanding, Southern Railway Home Guard, Deepdene End, Deepdene Wood, Dorking, 1 August 1941. Circular, Freight train arrangements on the occasion of the funeral of His Late Majesty King Edward VII, issued by H A Watson, General Superintendent, North Eastern Railway, 17 May 1910. Circular "Public Road Level Crossings - instructions to Station Master, Signalmen and Crossing Keepers" during active military operations, issued by Southern Divisional Superintendent's Office, Southampton Central, 18 November 1941. Marked Secret. Circular entitled: Obstruction of Railway Scheme - Rail Train Blocks, made by Southern Railway and released on 30th June, 1942. 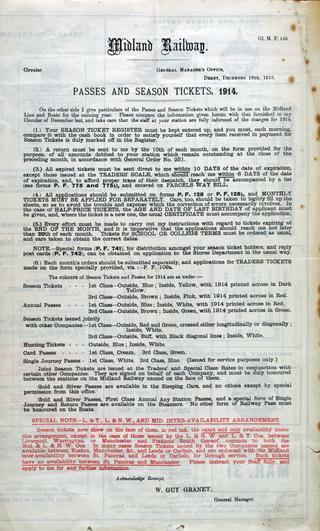 The document relates to the erection of rail tank blocks on Southern Railway lines. 3 sheets. York District Train and Traffic Control circular from the station master department at Malton Station to the Malton Station Signal Box. Circulars, 'Government Control of Railways' and re returns of Military traffic tickets, passes, services etc issued by Audit Accountants Office, Edinburgh, North British Railway,August-Septemer 1914. Circular from J Grierson, General Manager, Great Western Railway, Paddington Station, London re. opening of bi-weekly service of Steamers between Milford Cork & Queenstown for the conveyance of Passengers, Merchandise & Cattle, with details of running steamers & trains, 20 May 1875, printed and folded. Midland Railway printed circular from the General Manager concerning prohibitions of livestock movements by rail under the Contagious Diseases (Animals) Act, 7 March 1892. Found at Sandal & Walton station. Circular re. special arrangements for royal visit to Leeds on 7 Jul 1908.